Gain the practical knowledge you need to plan, design, deploy, and manage mixed cloud and on-premises IT management systems. Drawing on his experience as senior principal software architect at CA Technologies, Marvin Waschke lays out the nuts and bolts of the IT Infrastructure Library (ITIL)âthe 5-volume bible of standard IT service management practices that is the single most important tool for aligning IT services with business needs. Many enterprise IT management applications, and the ways they are integrated, come directly from ITIL service management requirements. Types of integration include integrated reporting and dashboards, event-driven integration, device integration, and application data integration. Enterprise integration depends critically on high performance, scalability, and flexibility. Failure to integrate applications to service management requirements results in such wryly anticipated spectacles as the annual crash of the websites of Super Bowl advertisers such as Coca-Cola and Acura. Waschke weighs in on the debate between those who advocate integrating "best-of-breed" applications and those who favor a pre-integrated set of applications from a single vendor. He also rates the strengths and weaknesses of the major architectural patternsâcentral relational databases, service-oriented architecture (SOA), and enterprise data busesâfor IT integration of service management applications. He examines the modifications to traditional service management that are required by virtualized systems of datacenter management and application design. Clouds present special problems for integration. 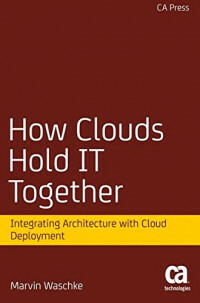 How Clouds Hold IT Together details solutions for integration problems in private, community, and public cloudsâespecially problems with multi-tenant SaaS applications. Most enterprises are migrating to the cloud gradually rather than at one go. The transitional phase of mixed cloud and on-premises applications presents thorny problems for IT management. Waschke shows the reader how to normalize the performance and capacity measurements of concurrent traditional and cloud resources. Solar technologies are emerging as the sustainable technology of choice for those commissioning new buildings. Integrated photovoltaics offer huge potential for delivering renewable energy without generating harmful pollutants.